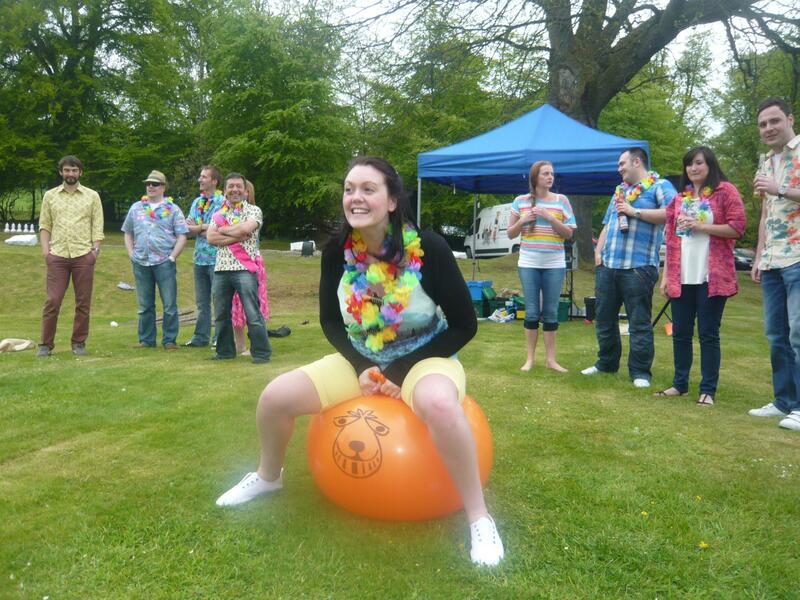 On the 31st May 2013 Thainstone House Hotel played host to a Hawaiian themed It's a Knockout for a large team from Expro Group. The sun was shinning as the teams arrived and before the activities began all were able to enjoy the wonderful weather whilst managing to grab a bite to eat. We kicked off with a high tempo warm up that left a few competitors wondering what they had let themselves in for. 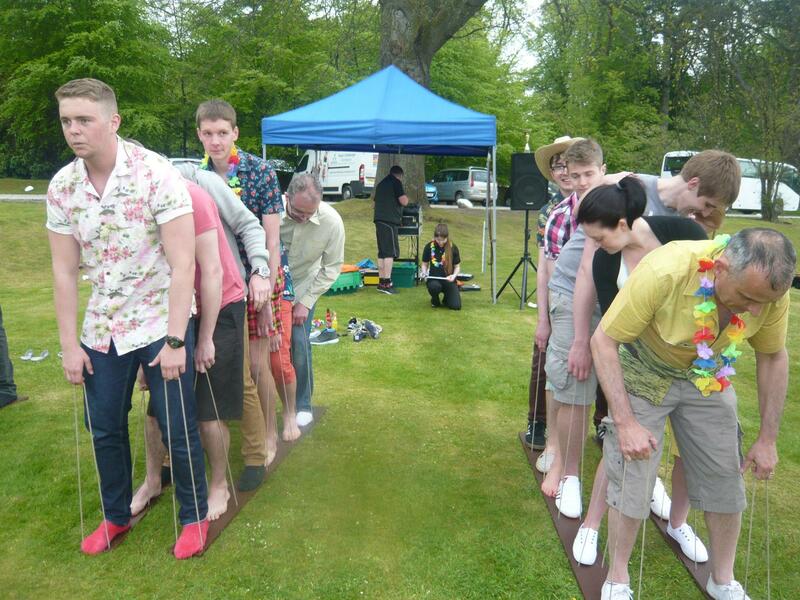 The teams were then split into different It's a Knockout zones and went head to head at each station. They were all raring to go and each time were determined that it would not be them to finish in last place. 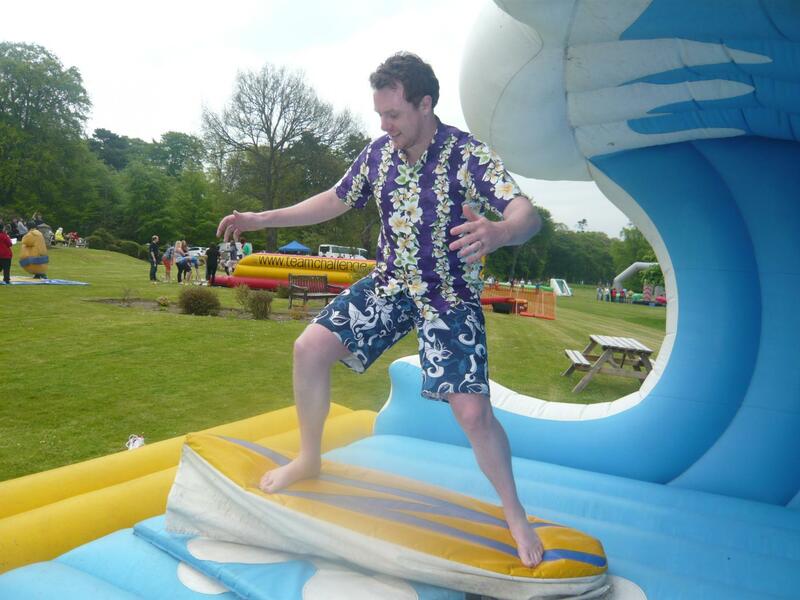 As the teams moved around the competitions it started to become clear that some were finding it harder going then others, this was most apparent on the It's a Knockout Surf Simulator where many team members struggled to get beyond 20 seconds. However looking to save his team from defeat Euan Cameron stepped up and managed to achieve a record setting time of 158 seconds this much to the disgust of all the competitors. Over on the It's a Knockout Sumo Wresting challenge there was no love lost between teams as they all battled hard as they all knew what was at stake. Meanwhile at the It's a Knockout Bungee Run the teams were battling it out to see who could get the furthest down and secure the points for their team. In the It's a Knockout second Zone the teams took each other on at the Human Football Table and there were some spectacular wipe outs over on the Human Demolition. With all Head to Head activities now complete it was the top 4 that would face off on the It's a Knockout grand finale. 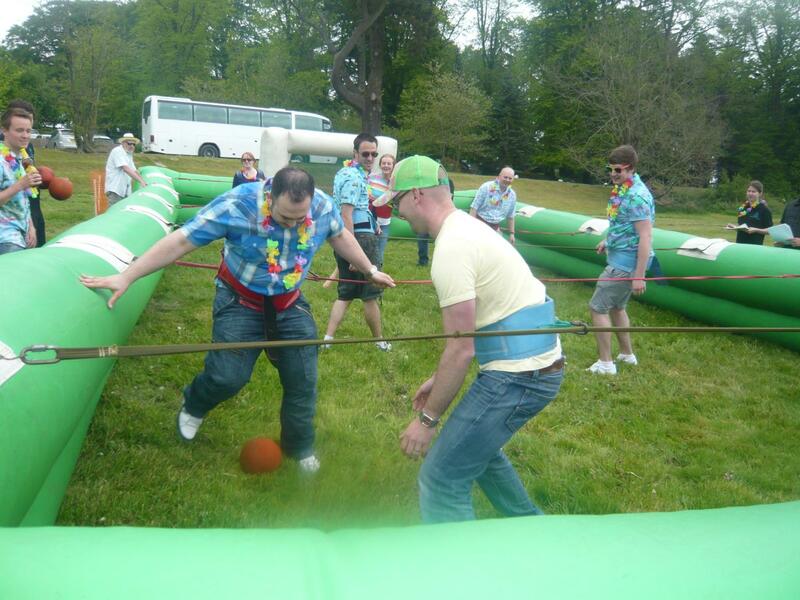 The finalists were made to go down the course using Obstacle Ski's which to everyone's surprise was made to look easy then on the way back the teams had to tackle the It's a Knockout Giant Assault Course before returning to their starting position. The scores were then counted and verified and taking home the Team Challenge Company Trophy wooden spoon with a score of 2400 were the.......... Strawberry Daiquiris. There can only be one winner and the day was no different so taking away the Team Challenge Company Trophy were the Bloody Mary's with a score of 5800. All the teams had a great day and a big thank you has to go out to Loren for organising this event, it was clear to see how much hard work and devotion you put in to every detail. We look forward to working with you all again in the near future. Thanks for the pics, it was really good fun and we all enjoyed the fresh air and challenge. All was organized in a very professional manner, yet relaxed, your team did a great job. I will pass on to the team. "Expro Group - you never fail to entertain us ! Great day at the wonderful Thainstone House Hotel..Loved the Gangnam Style dancing girls !!!!! See you all again soon - whatever the crazy theme may be ! Big Shout out to Lauren for pulling it all together - it was great to work with you and your team once again Enjoy the photographs - We did !!!! Stephen"